The Hayes are proud of its many awards - Primary Science Quality Mark, School Games Silver, Healthy Schools Silver, International School Award, Basic Skills Quality Mark (10 year award), STARS (sustainable travel) Silver, Bronze Rights Committed (Rights Respecting Schools Award) and the Inclusion Quality Mark. In September 2018, The Hayes Primary School was awarded the STARS accreditation (Sustainable Travel: Active, Responsible, Safe). This is the first time we have been awarded the silver award having been Bronze for many years. STARS is TfL's accreditation scheme for London schools and nurseries. STARS inspires young Londoners to travel to school sustainably, actively, responsibly and safely by championing walking, scooting and cycling. STARS supports pupils' wellbeing, helps to reduce congestion at the school gates and improve road safety and air quality. TfL's STARS accreditation scheme inspires young Londoners to think differently about travel and its impact on their health, wellbeing and the environment. 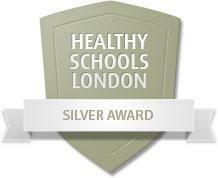 In September 2018, The Hayes Primary School was awarded the Healthy Schools Silver Award. This is the first time we have been awarded this accolade, having been given the Bronze Award for many years. We are very proud! We have been recognised for our achievements in supporting the health and wellbeing of our pupils. In addition to holding the Bronze Award, we undertook an analysis of pupils’ needs, and identified new actions that have helped pupils achieve and maintain good health and wellbeing. In September 2018, The Hayes Primary School was awarded the Silver Primary Science Quality Mark to celebrate a commitment to excellence in science teaching and learning. The Primary School Quality Mark scheme enables schools to work together to share good practice and is supported by professional development led by local experts. It encourages teacher autonomy and innovation while at the same time offering a clear framework for development in science subject leadership, teaching and learning. In April 2018, The Hayes Primary School was awarded the Inclusion Quality Mark Award. Ofsted defines an educationally inclusive school as one in which the teaching and learning; achievements, attitudes and well-being of every young person matter. The Inclusion Quality Mark provides schools with a nationally recognised framework to guide and recognise their inclusion journey. 'Teachers and support staff work closely together planning carefully to meet pupils’ individual needs. All the staff I spoke to during my visit were positive, energetic and fully committed to the pupils and to the school. They share a common, inclusive vision and they feel they have excellent support to enable them to do their work. The school ethos ‘be the best you can be’ applies to everybody in this school community'. 'All staff are involved in supporting the pupils and have the drive to improve their own practice to benefit the children. Lessons are well planned, interesting and challenging with many imaginative and exciting activities planned for pupils. Features of lessons include active learning, good modelling by all staff and assessment for learning strategies'. 'Professionals work closely together to ensure focused and specific targets are set to meet each child’s developmental and educational needs. A combination of robust teaching and learning strategies, strong inclusive values, a thorough tracking system and excellent behaviour systems, support the progress of all pupils including those from low starting points, pupil premium and MAT pupils'. 'Pupil voice is valued. Children have roles and responsibilities within the school including being mediators, playground buddies, lunch time helpers, on the school council and much more. The children love being involved as young leaders and relish the opportunity to do more'. 'Without exception between the staff, parents, governors and pupils I spoke to during my visit, I felt a genuine sense of mutual respect and collaboration. Listening, discussing and including everyone. THPS is an inclusive school where all children are valued and where adults work hard to ensure no child is left behind'. 'In my opinion THPS fully meets the standard required by the Inclusion Quality Mark. I recommend that the school be awarded the Inclusion Quality Mark’s Inclusive School Award. I also recommend that the school consider applying for Centre of Excellence status'. There are four key areas of impact for children at a Rights Respecting school; wellbeing, participation, relationships and self-esteem. The difference that a Rights Respecting School makes goes beyond the school gates, making a positive impact on the whole community. By promoting the values of respect, dignity and non-discrimination, children’s self-esteem and wellbeing is boosted and they are less likely to suffer from stress. A child who understands their rights understands how they and others should be treated and their sense of self-worth is strengthened. The Rights Respecting Schools Award gives children a powerful language to use to express themselves and to challenge the way they are treated. They are also able to challenge injustices for other children. Children and young people are empowered to access information that enables them to make informed decisions about their learning, health and wellbeing. Both with their teachers and their peers, based on mutual respect and the value of everyone’s opinion. In a Rights Respecting school children are treated as equals by their fellow pupils and by the adults in the school. Children and young people are involved in how the Award is implement in the school but are also involved in strategic decision-making; in decisions about their learning; and in views about their well-being. This builds their confidence to make informed decisions. They have a moral framework, based on equality and respect for all that lasts a lifetime, as they grow into engaged, responsible members of society. Children and adults develop an ethos and language of rights and respect around the school. Rights and principles of the Convention are used to put moral situations into perspective and consider rights-respecting solutions – this all has a huge impact on relationships and well-being. Children and young people get very involved in raising awareness about social justice issues, both at home and abroad. They become ambassadors for rights and take part in campaigns and activities to help to bring about change. "Since becoming rights respecting our children feel happier, safe and confident and are ready to learn"
The Basic Skills Primary Quality Mark Award has been awarded to The Hayes for the tenth time. It promotes, supports and celebrates progress and improvements in English and Mathematics. Without these ‘basic skills’ of good communication, literacy and mathematical skills, individuals are disadvantaged throughout their lives – as learners, in the workplace and as parents, consumers and citizens and so they form the ‘bedrock’ of a good education. To achieve a Quality Mark schools, The Hayes had to undergo an assessment, carried out by an external accredited assessor, against the 10 ‘Elements’ of the Quality Mark framework. These covered key aspects of the school’s improvement agenda, including the identification and analysis of the school’s needs; strategic planning; target setting for improvement; intervention and support for pupils under-achieving or under-attaining; provision of quality in both teaching and in resources; staff development; and active engagement with families. Effective monitoring and evaluation are also required - particularly to achieve renewal when continuing development by the school and evidence of impact of actions must be demonstrated.